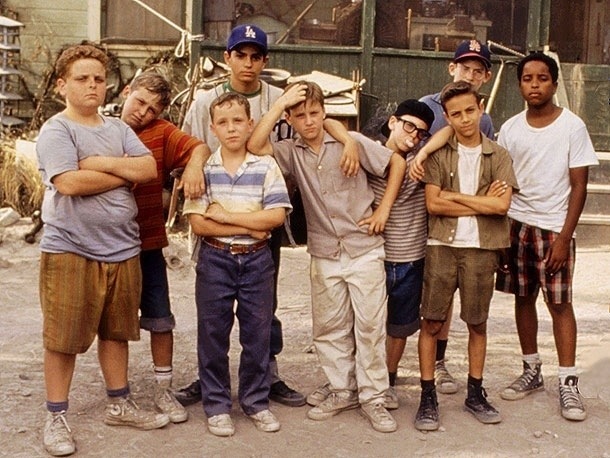 The Sandlot hit theaters on April 7, 1993 and there has not been a baseball movie like the classic since. The movie is a ballplayer’s childhood at the essence of America’s past-time. In The Sandlot, a real childhood is seen. There is no Facebook, iPhones, iPads or anything else for kids to sit inside all day. The childhood of these boys is pure and simple. Baseball is life, making friends, memories and getting into trouble is what makes them real and the audience a little jealous too. Personally, I feel sorry for kids today. They didn’t get to grow up with baseball movies such as: The Sandlot, Rookie of the Year or Little Big League. For numerous reasons The Sandlot still holds up as a favorite to kids, teens and adults. As with all great movies, it starts with the quotes. Whenever your friend decides to not be the brightest bulb there is, The Sandlot gives us, “You’re killin’ me Smalls!” No matter how big or small the person, the quote has been used millions of times. For the kids that can barely catch a baseball, Smalls has to be a hero to you. His transition from absolutely terrible to a good player was pretty comical. So, if you can’t catch the ball, just say please, put your glove up and for throwing purposes, get a paper route. If it wasn’t for The Sandlot, I wouldn’t be in love with my Pf Flyers, be tempted to name my first dog Hercules or be called “Yeah, Yeah” here and there as a kid. The movie has the narration of a Shawshank Redemption, but the scenes that any age would be hooked to. So today, join my Pf Flyers and I, and watch the boys of The Sandlot attempt to get out of the biggest pickle of their lives.